Jonathan Maracle not only build Eagle Wind Flutes but he also builds traditional Native American Drums with old world craftsmanship and materials. Each drum is hand crafted and great care is given to maintain traditional skills and designs to create these authentic Native American Drums. These Native American drums are made from natural materials from the Tyendinaga, Territories in Ontario Canada. The sounds they produce are the ancient sounds of the people of the land and are a testament to the history of the Mohawk people and of all Native American peoples. The sounds of the drums are being heard again in the land as people regain the indigenous sounds they were created to play. The drums can be custom ordered according to your specifications. Jonathan makes many different kinds of Native Drums and Native intruments with traditional materials and craftsmanship according to Native tradition. 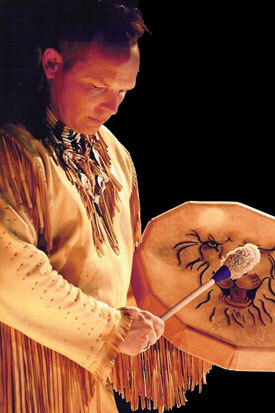 Master drum maker Jonathan Maracle uses only the finest traditional materials for all his Native drums. He takes the utmost care in choosing the wood, leather and other materials used in these drums to create am authentic, traditional native look and sound. Being a Native musician, songwriter, and drum player himself means he knows and understands what needs to go into a drum to make it sound and play the way it should. There are may drums on the market today that are mass produced and are not truly traditional hand made drums. 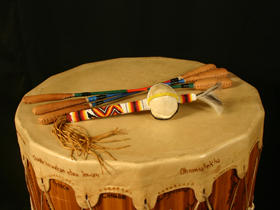 Jonathan’s instruments are hand made and are truly authentic Native Drums. At Eagle Wind Flutes we also build traditional Native Drums with old world craftsmanship and materials. Each drum is hand crafted and great care is given to maintain traditional skills and designs to create these authentic Native American Drums. These Native American drums are made from natural materials from Canada. The sounds they produce are the ancient sounds of the people of the land and are a testament to the history of all Native American peoples. Our drums can be custom ordered according to your specifications. Jonathan makes different kinds of native American Drums and intruments with materials and craftsmanship according to Native tradition. The main hide we use to cover our “Drums” is Moose hide. The Big Drum rims are made with cedar, hand drums are made of “Ash or Cedar” depending on the style of drum. Please contact us through the contact page to custom order your drum.